I live in a small 1 bedroom condo downtown Toronto. I share my place with Scarlet, my lovely 4 year old cat, who has a sensitive stomach and can get (and does get) very stinky. There’s really no place to hide the litter box and my bathroom doesn’t have enough room (so there’s no turning on the fan), so she does her business in the living room (thank god for covered litter houses). 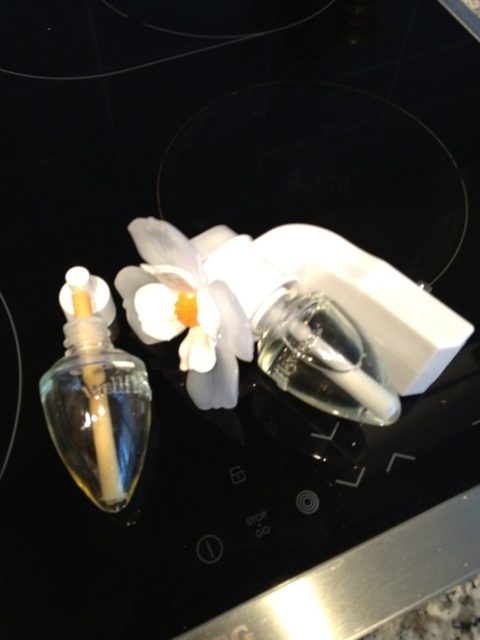 As a result, I am slowly becoming an expert on home fragrance and fresheners. Candles are not preferred for me. First off Scarlet doesn’t quite grasp the concept of fire and burning and likes to get close and smell the flame. Besides, they can’t be left lit when you aren’t around and have a limited life span. Room sprays are quick ways to mask an odor but don’t last and I don’t care what the commercials say-they don’t attack the cause of the odor in the air. Basically they mask the odors for a brief period of time and then nothing! I tried using scent bugs that heat up essential oils to fragrant the room. I like the safety factor-you can leave it all day, but the annoying “hum” from the battery operated brands drive me crazy and the scent don’t quite fill the room. This leads me to talk about my current favorite method of keeping my condo smelling clean and fresh and less like Scarlet’s litterbox. Bath and Body Works have Wallflowers and Aromatherapy Scent Bulbs which plug into any outlet. They have a ton of different scents to choose from, and constantly have deals. Today I picked out 4 new scent bulbs for $24. The best part is once you get the wallflowers, all you need it to replace the bulbs-which usually last about a month to month and a half. What I love about these products is that they are continuous in freshening the area they are plugged into as well as are totally safe (no burning the condo or Scarlet’s face). I think having a good smelling home is important and also gives me the illusion of having a clean place when I may have gotten a little lazy on my housekeeping. My condo is very open so the rooms flow into each other. I get the most out of my scent bulbs by using the same scent in the hallway, which flows into the living room/kitchen/dining area (that has the same scent), which flows into bedroom that also is filled with the same scent. This consistency is welcoming and you get to reap the full benefits of freshness and great scents. The bathroom is always a different scent. This divide works best for what can easily be the stinkiest place in the house. Having a fresh, but separate scent makes it pop when you enter/exit the room as well as helps mask any unpleasant odors that frequently come from the toilet. Anyways, that’s my tip to get the most bang for your buck. If you are in need of home fragrance strategies, check out Bath and Body Works. Best variety of scents with the best price and the best long term results that I have found thus far – and in the past 4 years of being Scarlet’s mom I have been looking and testing everything. This entry was posted in House and Home and tagged AIr Freshener, Bath and Body Works, Home Deco, Scents by maldham. Bookmark the permalink.